The escapist possibilities afforded by portable electronic gadgets like PDAs and mp3 players are seductive. However, these objects generate virtual barriers between users and their physical reality. 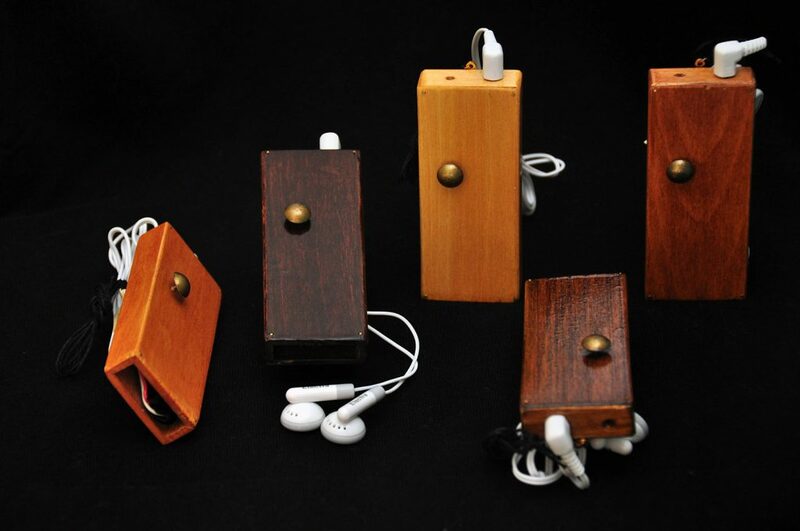 The hand-crafted wooden Personal Soundtrack Emitter shifts the role of the portable electronic device from an object that induces seclusion to one that promotes awareness of one’s environment. The device abstracts and reorders its user’s sonic environment into an intimate live soundtrack. It draws attention to the subtleties of one’s surroundings by heightening often-inaudible sounds (such as breathing and touch) and compressing more prominent ones. The Personal Soundtrack Emitters are listening devices that resemble 19th century mp3 players. Each device contains a modified sound amplifier, headphones, and control knob. When someone wears a Personal Soundtrack Emitter they amplify themselves as well as the subtle sounds that surround them. By tweaking the control knob they create interference on the circuit that results in distortion of their physical sound environment.